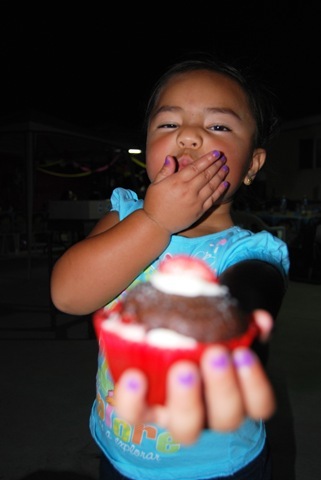 This weekend we celebrated my niece’s 3rd birthday. 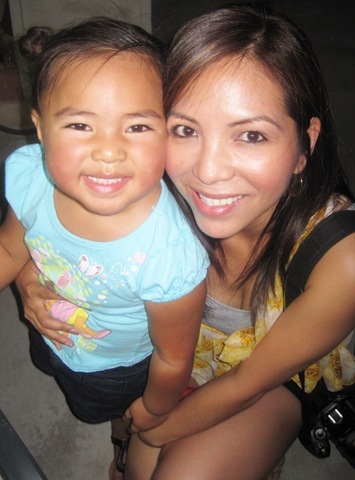 My niece Jazaleia (Jazzy for short) is my only niece and the only grandchild. She is the cutest and most adorable little girl and all her Aunties spoils her with attention. I love spending time with her. She’s at that age where you can have a whole conversation with her and be amaze that someone who is that young can talk so much. She has a large vocabulary. She leaves me cute voicemails and when I hear her cute voice and her rambling, it brightens up my day. We had a small get together with family and friends. My sister requested for me to bring dessert to the party. Typical family parties involved a lot of food and also desserts. Most filipino desserts are made with heavy sugar and milk, topped with condensed milk. It’s rich, dense and needless to say, very delicious. 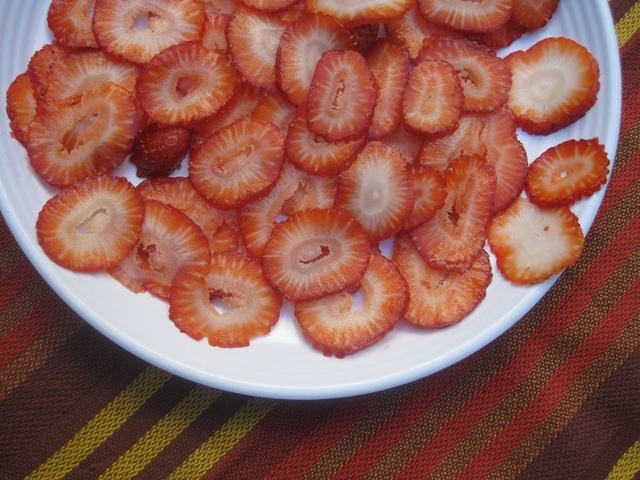 I wanted to bake a healthier and lighter dessert offering to the party. 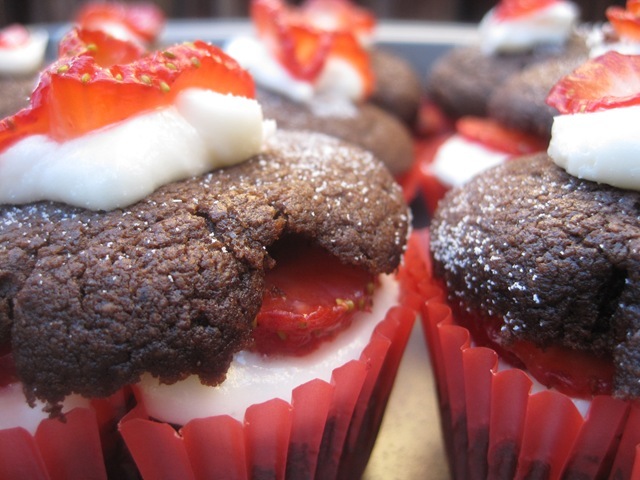 If you watch Food Network’s Cupcake War show, you’ll know that Chef Chloe won the competition with her Vegan Chocolate Strawberry Cupcakes. She’s the first Vegan to win on Food Network. Her cupcakes seemed easy enough to make and I had all the ingredients except for the coconut milk. I’m a fan of coconut milk but I wasn’t sure if the recipe called for the canned coconut milk or the boxed coconut milk in the refrigerated aisle. I was very excited to make the cupcakes, not only because it was healthier version of a classic flavor but it also looked very pretty and colorful. I made the following substitution from the original recipe. 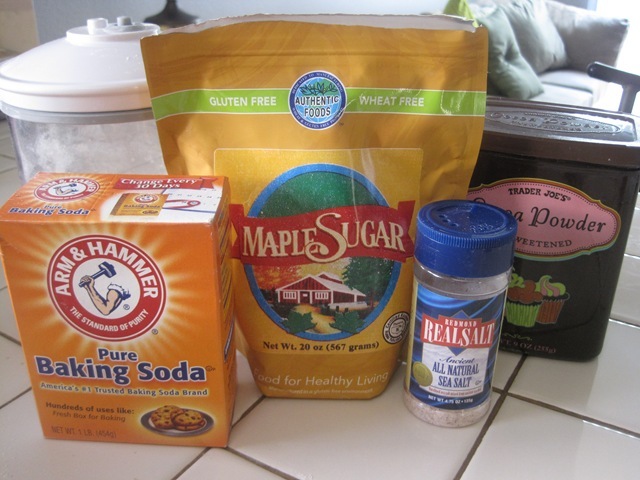 I used maple sugar because it’s healthier and does not leave me with a sugar crash after. I made the substitution for the flour, oil and coffee because it’s what I had in my pantry. 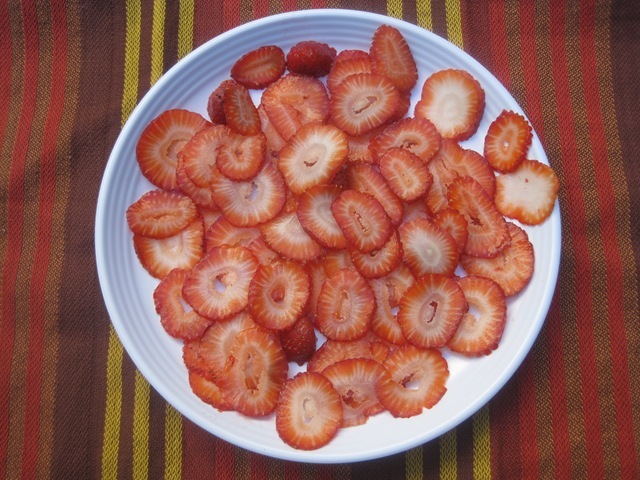 Make the frosting by combining sugar, oil, and vanilla extract in bowl of mixer; beat on medium-high speed until combined; with mixer running, add 1 Tbs. of water at a time, until reaching desired consistency. 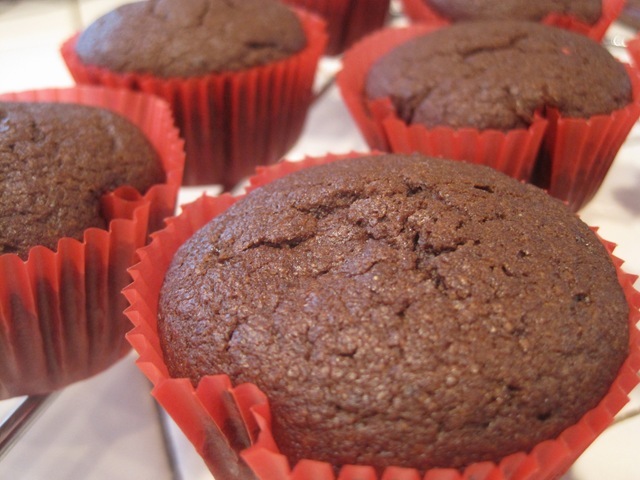 Preheat oven to 350 degrees and line a 12-cup cupcake pan with paper liners. Sift or whisk together flour, sugar, cocoa, baking soda, and salt into bowl; in a separate bowl, mix coconut milk, oil, vinegar, vanilla, and espresso powder until smooth. Pour wet mixture into dry mixture and mix with fork or whisk. Divide batter evenly among prepared cupcake liners until each cup is 2/3 full; bake for about 20 minutes or until an inserted toothpick comes out clean. 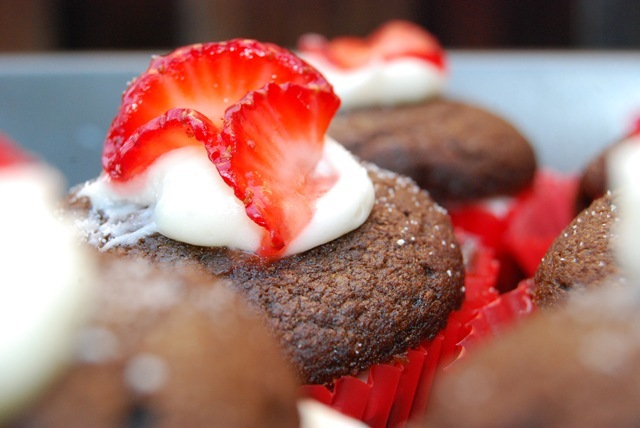 Once cupcakes are completely cooled, slice off top 1/3 of each cupcake and slather with frosting and sliced strawberries; place top of cupcake back on top and add a bit of frosting and sliced strawberries; dust with confectioners’ sugar. 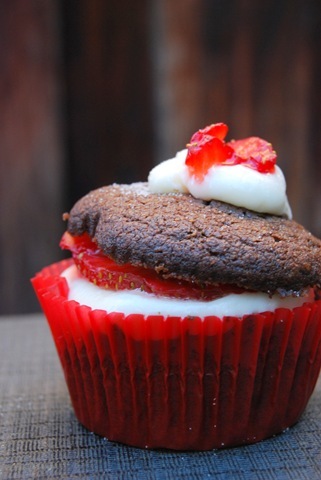 For more of Chef Chloe’s delicious cupcake recipes, visit www.ChefChloe.com. This was moist and very chocolaty without being too sweet. 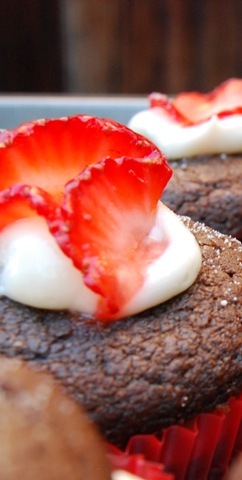 I love the layers of chocolate, strawberries and icing. It’s makes it very fun to eat. 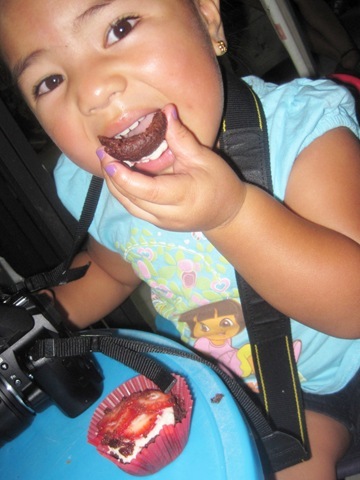 The birthday girl enjoying her birthday cupcakes. Cup cakes look very yum yum!!!!!! Btw I’m Song and so glad to find your blog! Oh, that’s awesome that she responded!!! 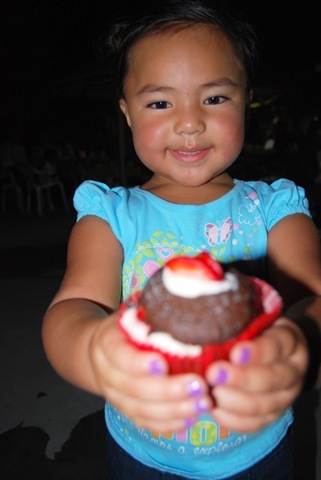 Great job w cupcakes, and your niece is so adorable. I saw that episode! These look so yummy. And beautiful! Your niece is so cute. Thanks Bianca. I missed the show when it first aired, but so happy that I saw the re-run. It inspired me to make the cupcakes. Your niece is super cute! Um, those cupcakes look fantastic – I am obsessed with cupcake ANYTHING so I’ll have to try your recipe. Thanks Shanna. I love your fun expressions Shanna…Yowsa! Kind of like Boooyaaa!! Yummy, Lea! Looks fabulous! You are being a very good cook/baker! Me, Jimmy, Evie and You should seriously open a cafe… here in the bay area!!! I think we can really do something great. OR a catering company since I am already a wedding planner…. bingo! those look INCREDIBLE! they are beautiful. mmmm! Wow that looks delicious. Your food all looks so good, I’m going to have to try those sometime soon. I love any and all reasons to bake. She’s so adorable. Yum cupcakes look delicious! Hi Lea! 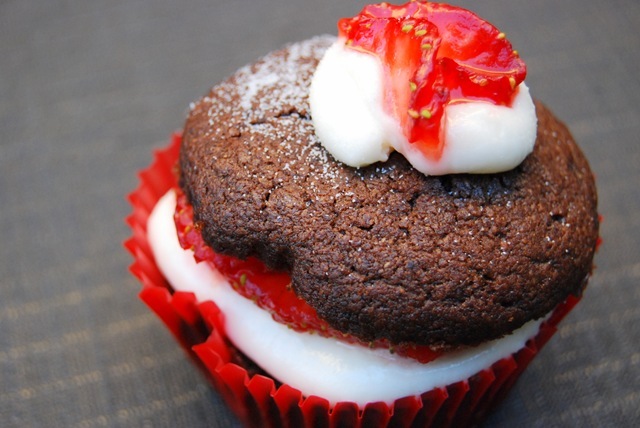 I love these cupcakes and will have to try making them. Happy bday to cute Jazzy– I’m sure you made her day with those awesome treats! Thanks for sharing the link. I can’t wait to make more of Chef Chloe’s creation. Congrats on making the Top 9. I just found your blog. I watch Cupcake Wars, but must have missed this episode. this cupcakes look amazing! Thanks for checking out my blog. I missed the finale too but I saw the re-run and it inspired me to make it. Your niece is too cute. 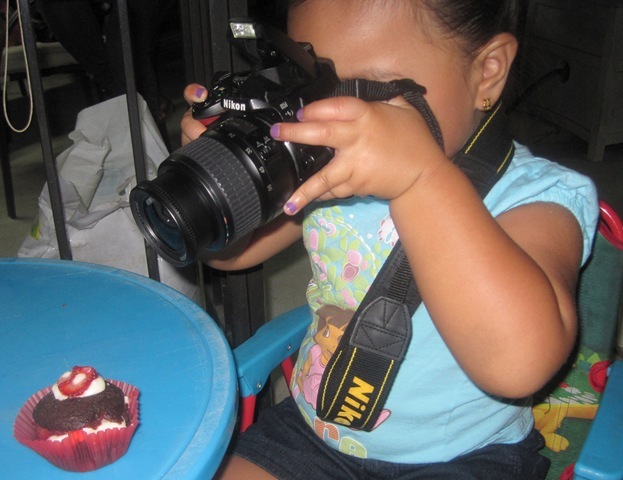 I love the picture of her photographing the cupcake! Those cupcakes looks awesome too. I like how you frosted the insides. I can never get enough frosting. Cute purple finger nails! 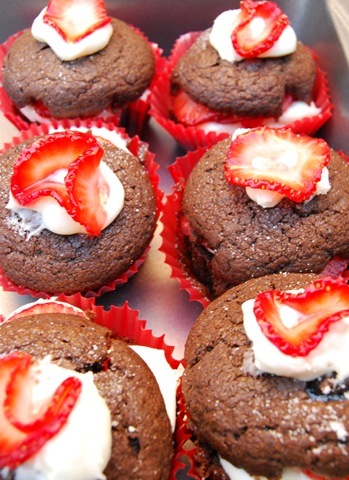 Love the recipe and the adorable red cupcake wrappers. she is so freaking cute!! These cupcakes look beautiful and so tasty! I’ll have to try these, thanks! I LOVE this recipe. It is even better when you use UNrefined Coconut Oil, and then you also get the health benefits! anyone actually made these and can comment on the cupcake?